We were out in West Milford, New Jersey, this past Saturday at the Festival. It was a great opportunity to get out in the public and meet fellow patriots. We met hundreds of people, handed out literature, and got some fund raising done in order to prepare for the next round of billboards. We were back in Albany this past Saturday to protest the NY SAFE Act. 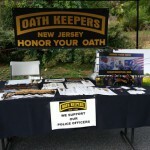 There was a strong turnout of Oath Keepers, bikers, and other patriots.